On the way up to Cortez, we stopped at Aztec, New Mexico just south of the Colorado border. 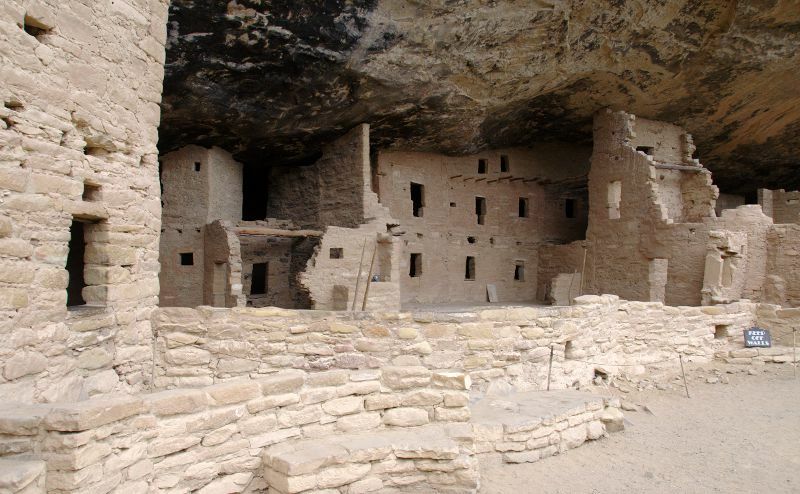 When Indian ruins were discovered there by early settlers, they assumed that Aztec Indians from Mexico had made them. This, of course, was not true, but the town had been named Aztec by then, so the name stuck. 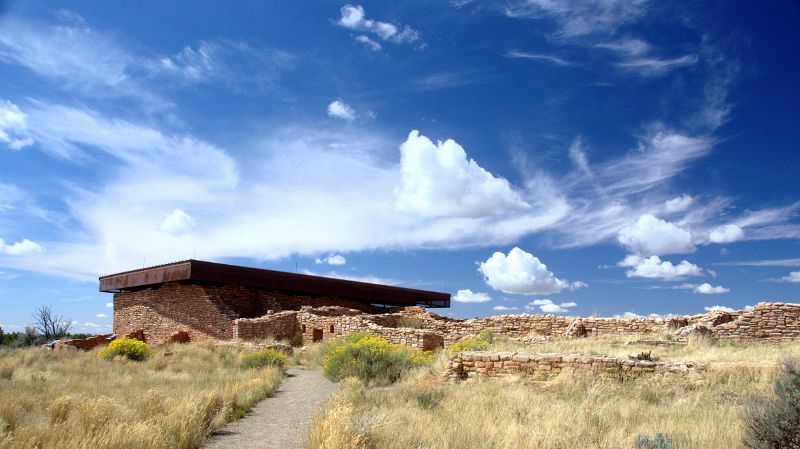 There are over a hundred rooms that were apparently used for food storage as well as living. 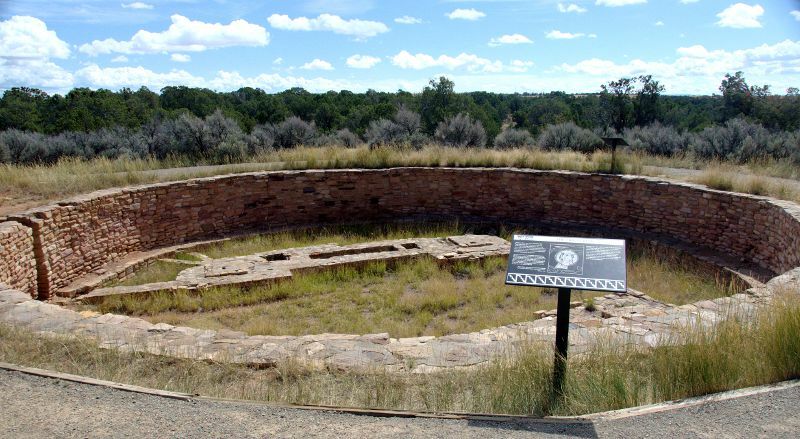 There are several small Kivas (round, partially sunken meeting rooms used for religious and other communal purposes), and one large one, which has been restored. 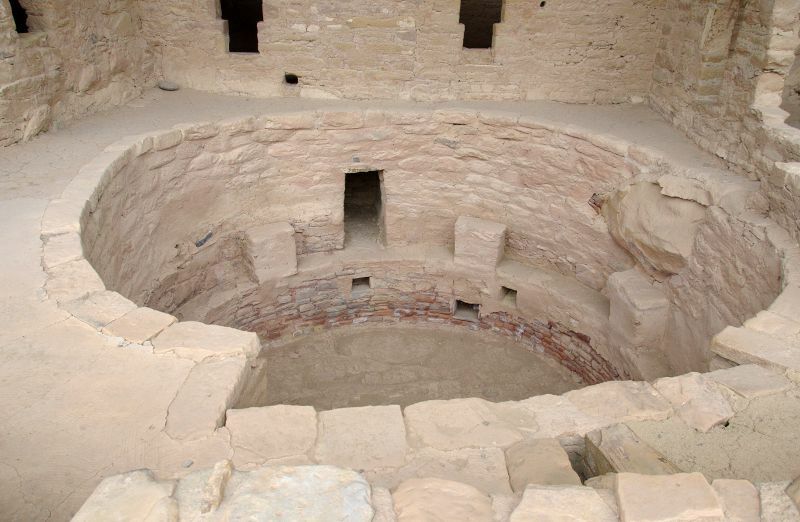 One of the smaller Kivas can bee seen in the lower right corner of the picture. 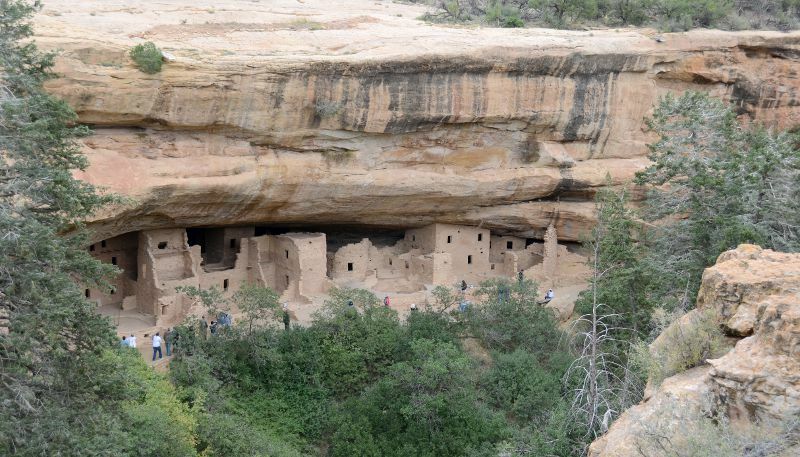 Near the town of Cortez, Colorado is Mesa Verde, the largest and most accessible Pueblo Indian ruins in the desert southwest. ...built into a natural overhang and cavity in the canyon wall. A small Kiva adds a finishing touch to the community. So how did the people get down into the canyons to build these structures? They made "ladders" by chipping out small holes in the soft sandstone canyon walls. 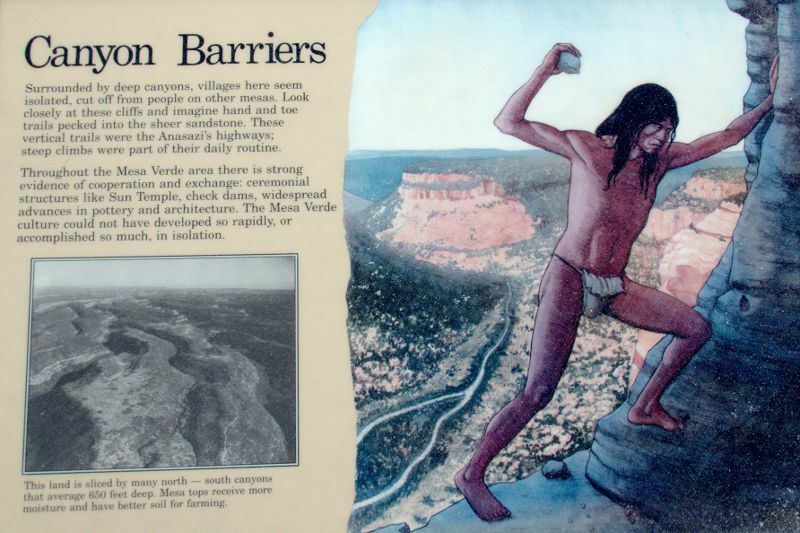 They made daily ascents to the mesa above to tend their crops and hunt. 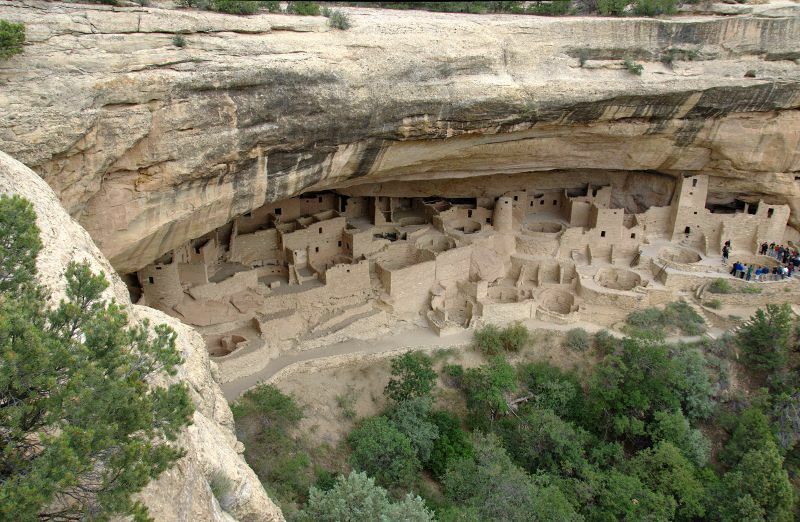 The largest ruin is called the "Cliff Palace". 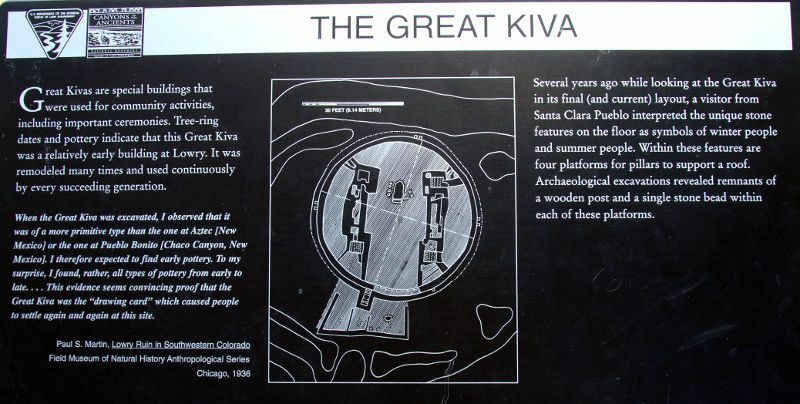 It is quite elaborate and includes multiple Kivas. It can only be visited by buying a ticket for one of the ranger-led tours, visible here at the far right of the picture. 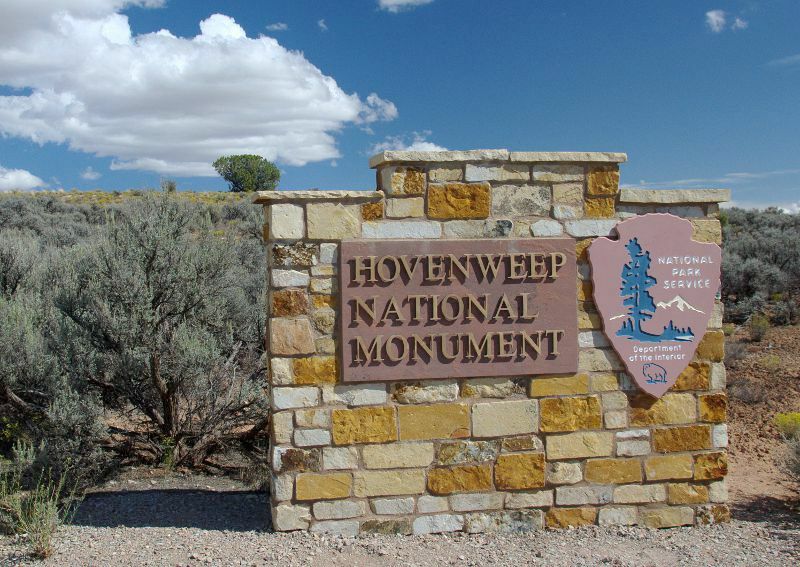 Hovenweep is a set of ruins west of Mesa Verde on the broad plateau of southeastern Utah. 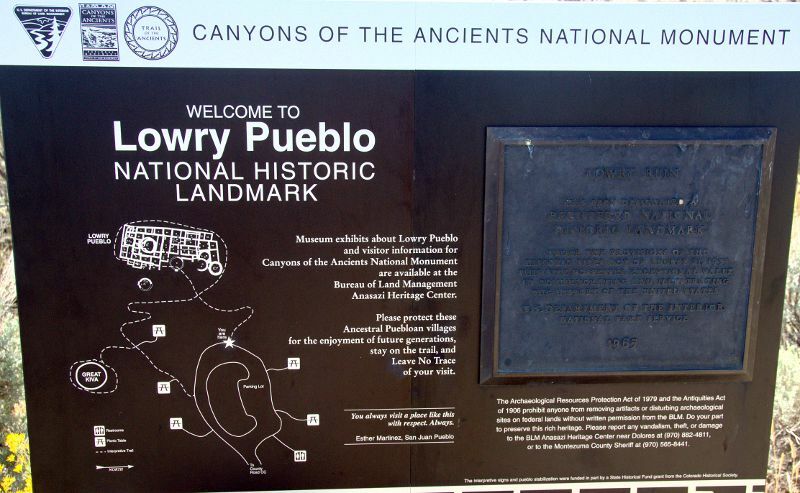 The structures are built on the canyon rims as well as into the canyon walls of the small canyons typical of this area. 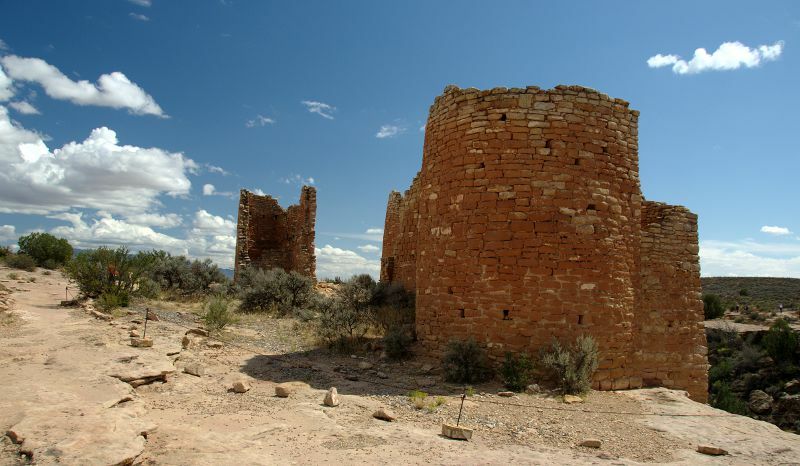 The structures include round buildings, which are unusual among the desert southwest Indian ruins. 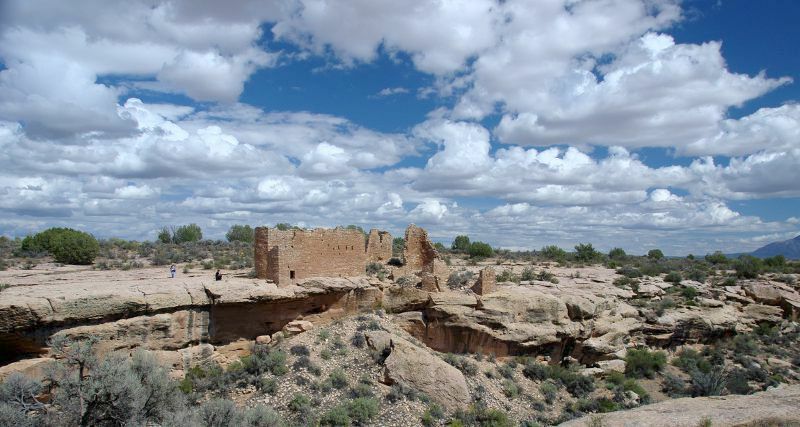 Lowry Pueblo is another easily accessible ruin on the mesa just east of Hovenweep. 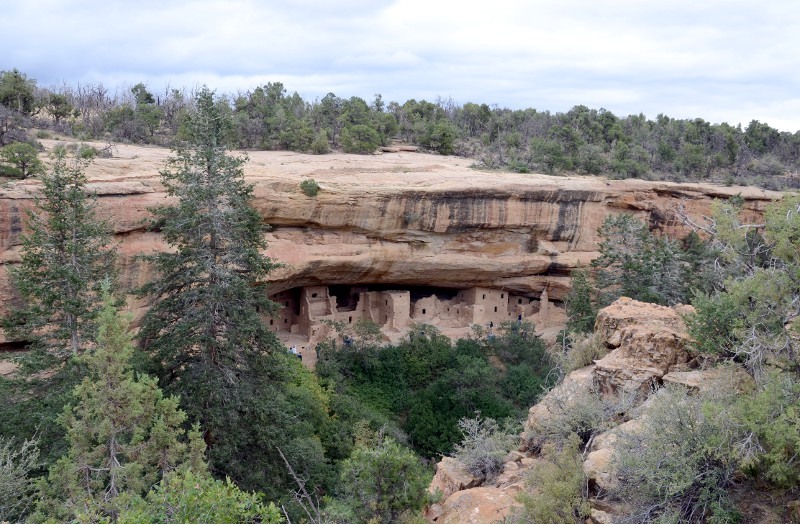 It has the typical multi-room living structures and two large kivas. 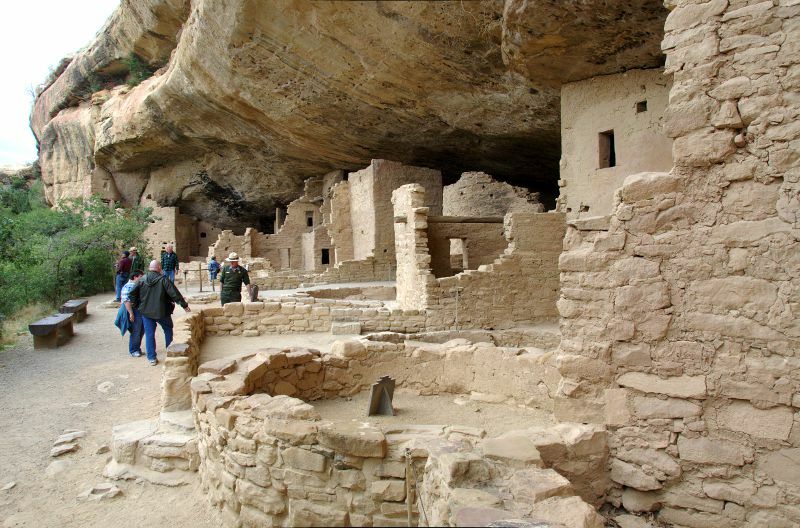 One of the kivas was found with the original wall paintings fairly well preserved. 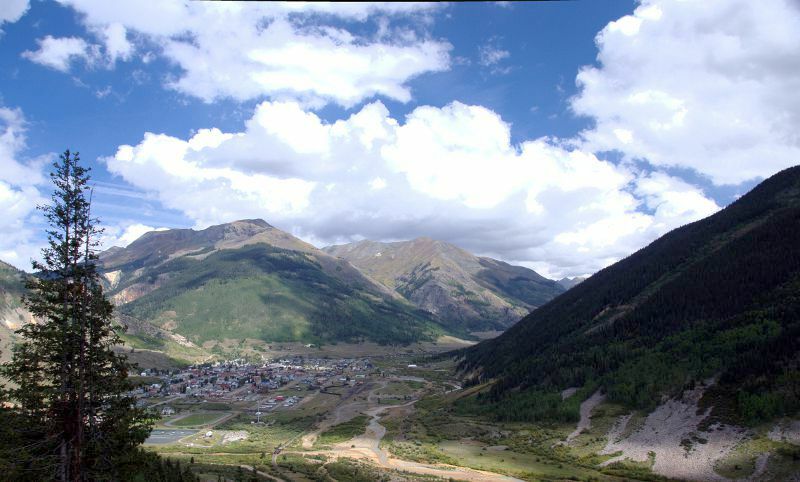 The National Park Service has protected these by building the large flat roof structure seen in the left of the picture. ...only the foundation walls remain. The "Four Corners" is the only place in the United States where four state boundaries come together in a single point. There is a small controversy about the location of the monument. 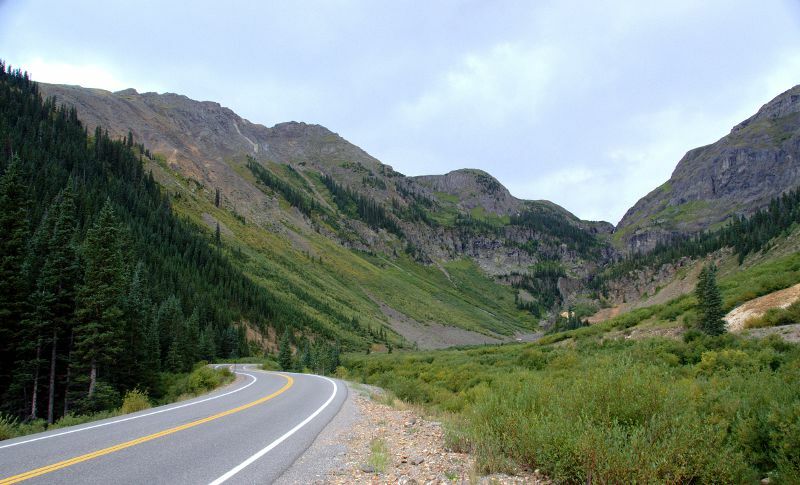 The border between New Mexico and Arizona, and Colorado and Utah was determined during the Civil War by Congress. It was supposed to be along a particular line of longitude using the "Washington [DC] Meridian" as a reference point. In 1884, a global longitude reference point was established at the Greenwich Observatory in London, England. This resulted in an offset of where the boundary "should" be. Using the Greenwich "Prime Meridian" as a reference point results in the intended boundary being 1807 feet east of where it is marked. However the state boundaries are legally determined by the original survey. Thus, the "Four Corners" Monument is at the "official" boundary locations, even if they are not where surveyors would place them today.